For the body represented on the diagram, determine the reactions of the supports. 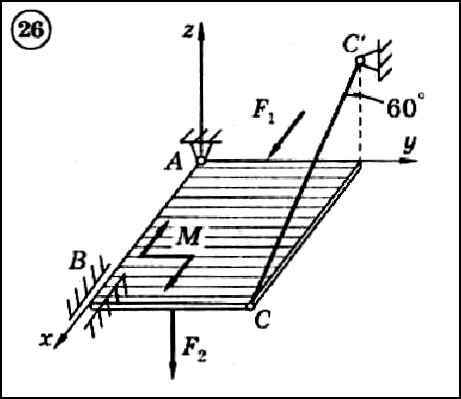 The body represents a homogeneous rectangular plate weighing G = 12 kN, measuring | AB | = 6m and | BC | = 2m. The plate is fixed by means of three supports: an articulated support (spherical hinge) at point A, a bearing support at point B and a support rod at point C. A pair of forces with a torque of M = 10 kNm acts on the plate and in the middle of the corresponding sides - Horizontal force F1 = 6 kN and vertical force F2 = 8 kN.